If anyone is looking forward to investing, planning for the long run or buying a financial product, a financial adviser can help him/ her out. Lots of people are there who take the help of the Model Portfolio Service when it comes to handling the financial matter with ease and comfort. Professional financial advisers understand the client’s goal, circumstances and how he/ she feels about taking financial risks. After evaluating everything, the professionals recommend the solutions which are suitable and affordable for the clients. 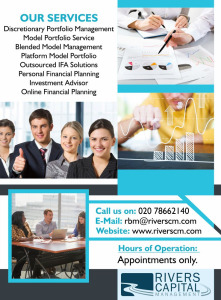 Rivers Capital Management is the best service provider who provides the solutions of Blended Model Management in London.